The time of year you're born can affect which health risks you're more prone to. First, we were told that there's a possibility that your birth order affects your personality type and future relationships. Now, a 2015 study published in the Journal of American Medical Informatics Association revealed the month you're born in plays a major role in your overall health. Researchers at Columbia University studied 1.7 million patients at New York-Presbyterian/Columbia University Medical Center over the course of 28 years to determine whether or not their birth month determines the type of diseases they are at risk of. 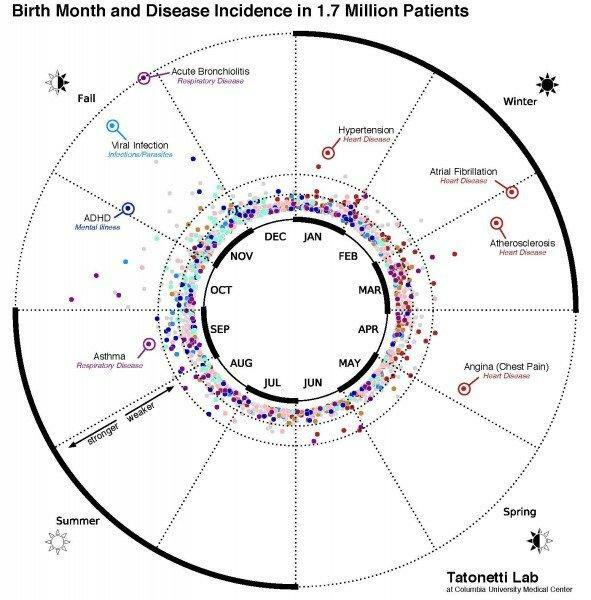 After comparing the participants' medical records to 1,688 diseases, they discovered that 55 of these diseases have a direct correlation to their birth month. The study found that "people born in May had the lowest disease risk, and those born in October the highest." "It's important not to get overly nervous about these results because even though we found significant associations the overall disease risk is not that great," said study senior author Nicholas Tatonetti, PhD, an assistant professor of biomedical informatics at Columbia University Medical Center (CUMC) and Columbia's Data Science Institute. "The risk related to birth month is relatively minor when compared to more influential variables like diet and exercise." Scientists concluded that July and October babies have a greater risk of asthma than any of the other months. But that's not all. They also found that "around one in 675 occurrences [of ADHD] could relate to being born in New York in November [while] people born in March [face] the highest risk for atrial fibrillation, congestive heart failure, and mitral valve disorder." Those born in winter and early spring have the highest risk for various heart diseases. "This data could help scientists uncover new disease risk factors," Tatonetti explained. According to Science Daily, the results of this study are comparable to similar data collected from around the world. For example, an earlier Swedish study also found high rates of ADHD diagnosis in November babies. Also, this study echoed a Danish study that asthma risk was highest for those born in May through August when "Denmark's sunlight levels are similar to New York's in the July and October period," exactly the months this study found the highest asthma risk. Researchers plan to replicate this method of study around the United States and abroad to see how various seasons and environmental factors affect results.